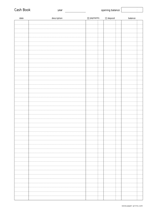 Cash book, or general ledger, to keep track of financials on an A4 size paper in a vertical, portrait orientation. Cash book, or general ledger, to keep track of financials on a letter size paper in a vertical, portrait orientation. Pocket cash book to keep track of daily spendings on an A4 size paper in a horizontal, landscape orientation. Easy to fold or cut and take one with you. Pocket cash book to keep track of daily spendings on a letter size paper in a horizontal, landscape orientation. Easy to fold or cut and take one with you. 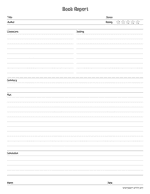 Book report on an A4 size paper in a vertical, portrait orientation. After reading a book write down an objective review. Book report on a letter size paper in a vertical, portrait orientation. After reading a book write down an objective review.